« Early Bird Tickets for TechCrunch Edinburgh! Plastic electronics is said to be one of the next big things, and it may just be worth a little thought. The Technology Strategy Board (TSB) sure thinks so, and they are offering £3 million to fund ideas in this emerging field. Compared to silicon, plastic electronics are cheaper, lighter, and more flexible. 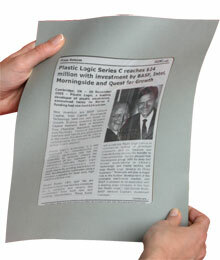 At the Consumer Electronics Show, Plastic Logic showed off a plastic e-reader which was all the rage in show floor chatter. Did you know the company was a spinout from Cambridge University?! It’s interesting to step back in time and watch this news announcement from 2007 when Cambridge labs were first making breakthroughs in this area. Seems they had a good vision of three years ahead, and I’m curious to see how their longer term thoughts on beaming internet straight to your contact lenses, remote controls woven into your couch fabric, or colour-changing curtains to indicate a friend’s arrival pan out. We would like leaders in business, academia and research and technology organisations to apply. We particularly welcome applications from designers and end-users – previous experience in the field of plastic electronics is not required – we are more interested in new ideas and insight into user requirements and – unmet needs.